You can walk trough the city yourself and discover the various places of interest in town. Many historical places have plates with information mounted. At the tourist office some sight-seeing tours are available and few times a week there is a guided tour wich takes you on a interesting trip. Thanks to bigwigs in the past Enschede accommedates some attractive parks. The volkspark, just a couple of minutes from the innercity, is a popular place to go on sunny days. The Ledeboerpark near the university or the Smalenbroek estate in the south tempt people to take the dog, run around or just have a nice stroll every time of the year. People and dogs enjoy the Ledeboerpark every season. There are several interesting routes available from 3 up to 30 kilometers long. Each routes covers another theme or subject such as architecture, history or nature. Beside these predefined routes its also possible to plan your own trip around the Enschede are using the walking network throughout Twente, the wandelnetwerk, with features many clear markings and good footpaths. 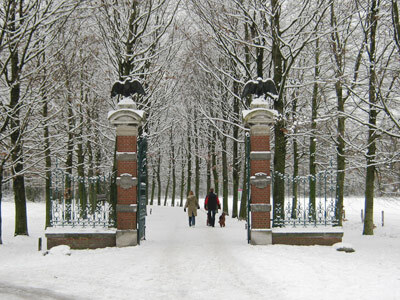 Some of the most beautiful parks and estates around Enschede.